Ben Franklin really got it right when he said that “an ounce of prevention is worth a pound of cure.” Despite the huge strides forward in medical knowledge and technology, being proactive about your health is still the key to aging well. Some of the age-old preventatives are still some of the best things we can do for ourselves today—you don’t have to accept aches, pains, and disease as part and parcel to an aging self. A lot of the same rules apply for dietary needs no matter your age: Eat lots of whole foods, especially fruits and vegetables, make good fats your friend, get a variety of vitamins and minerals to support your body’s various functions. And eating a balanced and properly portioned diet helps maintain a healthy weight, which also prevents various common diseases, including Type II Diabetes and heart disease. But as you age, some considerations do take place. While some people will still continue to need about 2,000 calories a day, many people need fewer calories—but, according to the National Institute on Aging, you still need the same amount of nutrients. Which means you have to eat economically. So what foods help you hit those nutritional goals? Think about salmon or avocados, which are packed with omega-3s and monounsaturated fat, respectively. They support brain health and help keep you fuller, longer. Make sure you get enough Vitamin D and calcium—got milk?—to support bone health. And if you’re hoping to keep skin smooth and taut, Vitamin C (which helps make collagen), Vitamin E, and carotinoids such as lycopene, retinol, polyphenols and resveratrol help keep skin in tip-top shape. One last perhaps lesser-known fact: As you age, you produce less stomach acid, which means it is harder for your body to break down your food and extract folic acid, or vitamins B6 and B12. Eating foods to provide your body the right nutrients could help. There’s no pass out of gym class, no matter your age. In fact, exercise plays an important role in preserving your health beyond the calorie burning. Many diseases associated with older adults—Alzheimer’s, dementia, heart disease, and diabetes, for a few examples—are thought to be, in part, related to inactivity. According to Today’s Geriatric Medicine, older and elderly adults should be logging about 150 minutes of exercise a week. Instead of the old recommendation of at least 30 minutes a day, leading experts say at least 10 minute chunks twice a day, across all seven days, will go a long way in benefiting heart and lung function. Many worry that falls or accidents can be issue with exercise, but the opposite has proven true: More exercise increases mobility, allowing people to live independently longer, and prevents balance and weakness issues, which means less falls in the long run. 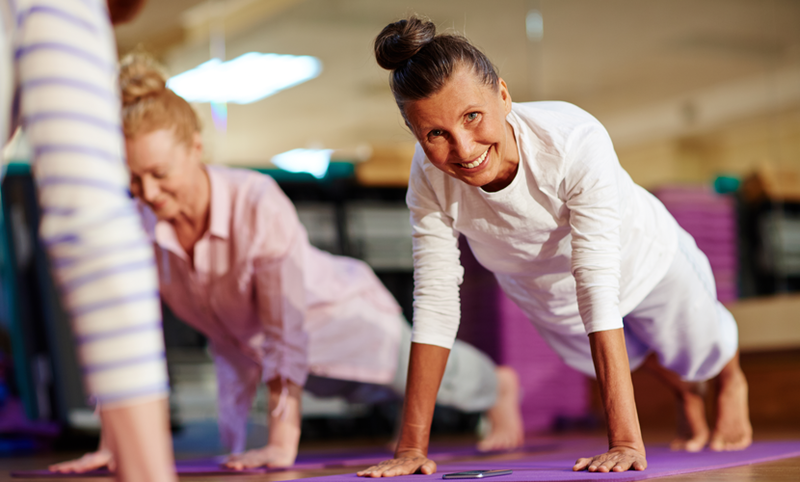 Walking, lifting light weights, tai chi, swimming, tennis, and yoga are all lifelong sports and activities that can help maintain bone density, flexibility, mobility, and more. According to the American Psychological Association, at least 20 percent of patients 65 and older have a mental disorder such as depression — and this age group is less likely to seek and get help. It can complicate illnesses like heart disease or exacerbate symptoms of other diseases, such as cancer. Thankfully, there are some steps you can take to mitigate symptoms of mental illness. First, The American Society on Aging reports that just the simple act of reminiscing—thinking about a childhood home, the smell of a favorite dinner, or other memories of the past can help restore well-being. And exercising 100 minutes a week can also help improve mental well-being. Meditation works, too. In fact, there is a whole category of practices under the Mindfulness Based Stress Reduction umbrella that have shown to significantly help a person’s frame of mind, enabling people to cope with illness, stress, and pain. Sitting meditation is the commonly known type of meditation, wherein sitting still and practicing letting thoughts go, being in the moment, and focusing on breathing helps people stay present and identify ways to feel in control in response to the outside world. Yoga, tai chi, and acupuncture can also work to improve mindfulness and breathing techniques that are key to calming the body and mind. And for the tech-savvy set—there are lots of apps that guide mediation and relaxation. The Center for Disease Control reports that fewer than half of all people over the age of 65 come in for their regular preventive care and health screenings. And for those over the age of 50, fewer than 30 percent are up to date. Taking advantage of these covered services can go a long way in helping establish baselines, prevent disease, and treat disease at an earlier stage. Not only are there health benefits to regular checkups—there are financial ones too. The World Health Organization recommends preventive care screenings for a multitude of reasons, including: early and optimal management of a diagnosis, optimizing physical and psychological health and well-being, detecting and managing behavioral and psychological symptoms, and providing information and long-term support. Getting regularly scheduled exams and immunizations also means you’re more likely to maintain better quality of life overall. Tests to expect include: cancer screenings (especially breast, colon, and prostate), cardiovascular screenings, dementia, hearing and visual testing, and blood pressure and blood sugar levels. When physicians get to know you, help you establish good habits, and give you choices to navigate your care, you’re more in control of a healthy future. To schedule your annual preventative care screening, make an appointment online or call 763-581-CARE.